Modern day closets tend to provide more space than ones from the 1950’s and earlier. You would think that bigger closets were easier to organize but when there is extra space, people tend to just place stuff everywhere/anywhere and it gets pretty chaotic and out of control (same thing applies to kitchens too). Like I have said before, space is not always the problem, rather, it is how well the available space is used and maximized. My master bedroom closet is not too big but also not exactly small. You can walk in it but it is not ideal to fit more than one person at a time. About two years ago, I resolved to better organize it. Since we were on a tight budget, I chose to spread out my acquisition of closet containers and organizing tools. I allowed myself to buy one to two containers a week which worked well for the way I budget. So how does a professional organizer begin organizing a closet? If the size of the closet and it’s contents are not too extreme, I will suggest removing all the contents and sorting them as we go into the following categories: Keep, Donate, and Trash. Sturdy trash bags are great for the donation pile but make sure you don’t mix it up with the trash bag. During the sorting process I begin to sort the keep pile into relevant categories. The categories I choose are different for each client and based on how they dress and what their learning style is (kinesthetic, auditory, or visual). I do this to make returning items to the space more streamlined. The process of removing items from a space takes a lot longer than it does to return them (and often there is less to return). Once everything is sorted and you know what you are going to keep, it’s time to assess how much there is of something and how much space it will need in the closet. 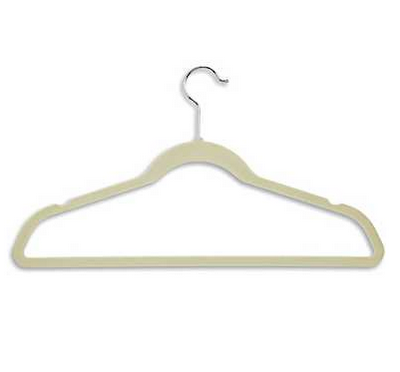 The best hangers are covered in a velvet like materiel and you can find them in nearly any store that carries hangers. I recently changed out over 250 hangers in a client’s closet to these velvet ones and it looked wonderfully clean and seamless. 2) Decide if hanging or storing in a container or dresser is better. Since I have limited closet space, I choose to store some clothing in a dresser. I also use black and red containers and totes to store other items like belts, my running accessories, and other like kind small items. Yes, nearly every square inch of that rack is being used! It’s the only place to hang long items. Fortunately, I rarely wear dresses and don’t own many as a result. 3) Label all your containers or totes! It helps with maintenance and when you need someone else to find something in your closet. I even labeled our laundry baskets! 4) Have an intentional place for your shoes. I store my shoes on a shoe rack and in a hanging shoe organizer. My smaller shoes like flats, sandals, and flip flops are placed in the hanging one and I try to squish two in each compartment. 5) Edit as you go. Have a place to put items you want to donate in your closet. This allows you to consistently edit your closet and prevents it from becoming a long drawn out event. When you see an item you no longer love, haven’t worn in years or doesn’t fit anymore, place it in your donation box. A couple times a year, grab the box and take it to a donation center. Simple! Dare to be creative when it comes to storing small items in your closet. For instance, I chose to use up extra wall space by putting up hooks for all my necklaces. I even converted a belt hanger into a necklace holder. Command hooks are great for this if you don’t want to commit to a hook permanently placed on the wall. Additionally, I use a hanging pocket organizer for my earrings and other tiny accessories. I place more than one pair of earrings in each pouch to maximize the space. This particular one has more zippered pouches on the other side and is hung on the back of the closet door. I found this at TJ MAXX for only $7. 7) Use hard to reach shelves for storing items you don’t use or need regularly. Any space easily within your reach is prime real estate. Those areas should specifically store things you use often. Therefore, those hard to reach areas, that may even require a step stool, should be used for items you don’t need to retrieve often. I store some old photos on my top rack. I am a sentimental person and love to look back at them maybe once a year. You can also see that I store our games up there too (not the kid ones). We used to have company over a lot and then we had kids. You know how it goes! 8) Don’t force yourself to color code your closet. It’s over kill for most people! One of the things I have realized while working in my profession is that one of the precipitating factors in someone’s ability to stay organized is how simple their system is to maintain. For instance, when someone feels the need to color group their clothing religiously. This extra step may overwhelm the process and bring on anxiety and dread over putting away their clothes or doing their laundry. Therefore, you have my strong approval to group clothing by type (tank tops, dress shirts, long sleeves, etc), not necessarily by color. If you love to group by color and it consistently works for you, great! Seriously! It does make a closet look that much more put together and is why you see it pictured that way in magazines. It’s just not for me and I have seen it trip up a lot of people’s ability to maintain their closets. O.K. I know you are wondering where all my hubby’s stuff is (besides his shoes)! Well, I am lucky that he has yet to need a lot of dress clothes so his wardrobe is smaller than mine. He stores most of his clothing in his dresser and has maybe 1/3 of the hanging area. Who’s ready to tackle their closet now? What tricks do you use to organize your closet? I love hearing what works for my readers!